Welcome to Peak Performance Chiropractic! 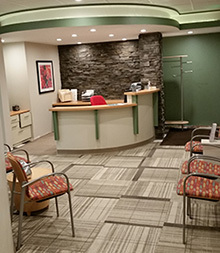 New patients often remark how beautiful our office is. That’s good, because our goal is to offer state-of-the-art chiropractic care in a comfortable surrounding. No scary anatomy posters or skeletons here! Convenient to Route 90, 787, Route 9 and Albany Shaker Road, you’ll find plenty of convenient parking and a well-lit parking lot. You’ll be greeted by name when you enter our office and given a short tour to get you acquainted with our facilities. If you’ve already completed your admitting paperwork, great! If not, you can do it here! Then you’ll meet Dr. Luper. The purpose of your consultation with the chiropractor is to discuss your health goals and see if chiropractic is likely to help you. If it looks promising, a thorough examination will help identify the cause of your problem. Next, what to expect at your second visit.